Conserve Oilfield Services is an established market leader in the rental and sale of DNV2.7-1 / EN 12079 certified offshore cargo carrying units (CCU’s), baskets, containers, chemical transport tanks, related equipment and services for the global offshore oil and gas industry. All Conserve units are designed, manufactured and certified to suit offshore regulations, adhere to international quality standards, and designed in accordance with DNV2.7-1 and EN12079. Conserve is focused on improving safety for personnel and cargo, while providing added value. Conserve was the first rental company to introduce Step Change units, which are designed in accordance with the published Step Change in Safety Guidelines for cargo baskets. All cargo baskets are certified in accordance with EN 12079 / DNV 2.7-1 standards and their fork pockets are raised 45mm from the ground to minimise entry of debris. Conserve owns and rents a range of uniquely designed safety chemical tanks, which comply with the International Maritime Dangerous Goods (IMDG) code. These units eliminate 99% of potential hazards in comparison with conventional chemical tanks. Designed to be lower than standard tanks with the same overall footprint, the adapted profile enables checks to be made without steps or ladders, minimising safety risks of working at heights. 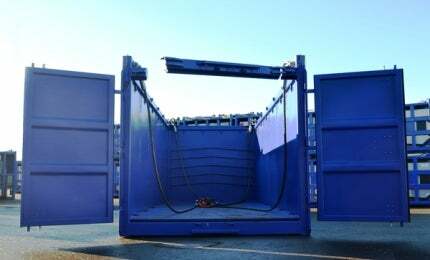 Offshore framed (IBCs): 1,000l capacity suitable for hypo. Conserve Oilfield Services are part of the Centurion Group of Companies including, Jacks Winches, RentAir Offshore, Seanic Ocean Systems, Tristar Water Solutions and Mining Camps Australia. The Centurion group offers its services in the UK, Europe, Middle East, Africa, Americas and Asia Pacific, delivering packaged equipment rental and service solutions to enhance client operations. Aberdeen-based specialist container and tank rental firm, Conserve Oilfield Services is investing more than £1.5m in new equipment to support international growth.